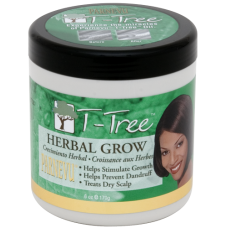 PARNEVU T-Tree Herbal Grow is uniquely formulated to stimulate healthy growth while treating dandruff and eliminating flaky, dry, and itchy scalp. Regular use naturally promotes growth and the healing process for total hair and scalp health. Try PARNEVU T-Tree Shampoo and T-Tree Leave-In Conditioner for a complete curative system. Directions for Use: Massage a generous amount into scalp daily. Comb through gently from roots to ends. Re-apply to dry, damaged hair and scalp as needed. Excellent for natural, relaxed, pressed, curled, or color-treated hair. Size: 6 oz. / 170 g.
INGREDIENTS: Water (Aqua, Eau), Steareth-20, Glycine Soja (Soybean) Oil, Polyquaternium-37, Propylene Glycol Dicaprylate/Dicaprate, PPG-1 Trideceth-6, Lanolin, Steareth-2, Laneth-15, Melaleuca Alternifolia (Tea Tree) Leaf Oil, Equisetum Arvense Extract, Salvia Officinallis (Sage) Leaf Extract, Urtica Dioica (Nettle) Extract, Hydrolyzed Wheat Protein, Panthenol, Phenyl Trimethicone, Dimethicone, Soluble Collagen, Hydrolyzed Keratin, Tetosodium EDTA, Glycerin, Fragrance (Parfum), Methylparaben, Propylparaben, DMDM Hydatoin.